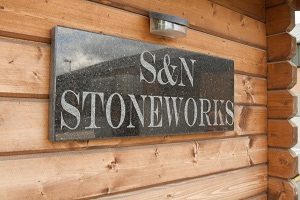 S&N Stoneworks UK was founded in 2005 during the making of a Chinese restaurant, purely by chance you could say. Steven McDonald started a small joinery business back in 1999 after working in some far flung places around Europe and the US. While completing a local Chinese takeaway, the owner requested that the serving counter be made from Black Granite. We found a company nearby and ordered the required counter top. We were both happy with the piece, however, both shocked at the price. That was when the light went on in my head. Surely granite can't possibly be so expensive? From that day on the future was set in stone, literally. At first I located a few nearby granite fabricators and started pushing granite and quartz worktops with all the kitchen installs we were doing. All the while doing my best to keep the price as low as possible. I knew the future was to start my own fabricating company, however as i soon discovered everything associated with cutting and polishing stone came at a very high price. Tools, saws, polishing discs, etc etc, all very expensive. I approached one of my suppliers only to be told there was now a 3 week lead time and nothing could change this. That was it. I went out, bought what i needed, called a local stonemason i knew and overnight moved into his workshop, agreeing to pay half the rent for the premises. Started advertising, built a website and started working. Very hard. I remember the very first piece I made. It was an Island made from Blue Pearl granite. At first my techniques were very old school. Cutting with a small saw, running it against straight edges to the required size. Leaving saw marks all over the edges making the polishing long and very laborious. The end results however were as good as any other fabricators. I'd never cut draining flutes into stone before, the first time made me very nervous. I practiced on a scrap piece then on the real thing. Bare in mind the cost to me if it went wrong! The first flutes although not perfect in my opinion seemed to please the clients no end. It truly was a very humble beginning. Everything in the workshop we own now was bought outright with no loans or credit from anyone. (although slightly overdrawn sometimes) We just worked, saved, bought what we needed and kept reinvesting everything straight back into the business. Now we own all the machinery required to fabricate even the trickiest and most complex commissions. We still keep our prices as low as possible, probably sometimes a little too low according to some of our past clients. My theory however is, better to be busy than chasing the money. Better to get the job done and make a little, than worry about the next job coming in because you maybe priced it too high. We now supply to a number of large kitchen suppliers including, Howdens and B&Q also a number of smaller joinery firms. Apart from the odd chip or scratch to repair, we have never had a dissatisfied customer. My standards are the highest. Nothing leaves the workshop until it is in my mind. Perfect. We will advise and provide you with the best quality stone we can find and do our best to agree on a price within your budget. If you do have any questions please call me personally for free no obligation advise. Our future is Set in Stone to provide you the best service possible.. 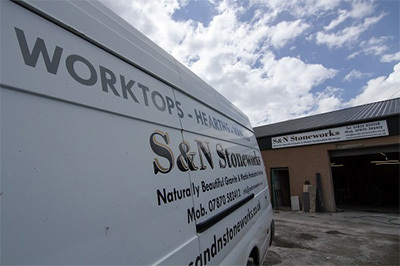 Copyright S&N Stoneworks all rights reserved.